Present state: The station is extant and is largely unaltered externally. It is now a private residence. The overbridge to the west of the station is still extant. Notes: The station served the villages of Bluntisham and Colne. It had a single platform on the down side of the line and was the second train staff and ticket station on the branch. 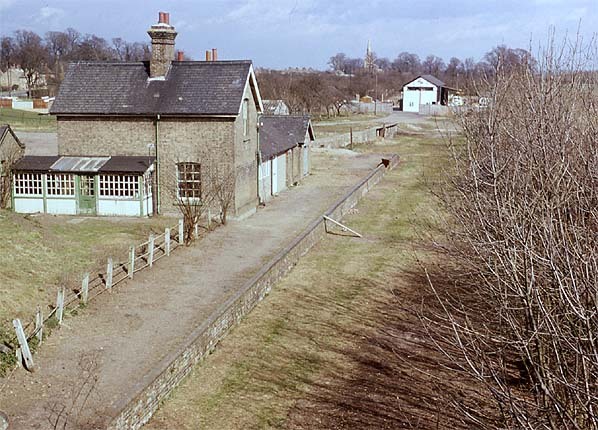 Station buildings included the stationmaster's house, booking office and waiting room. 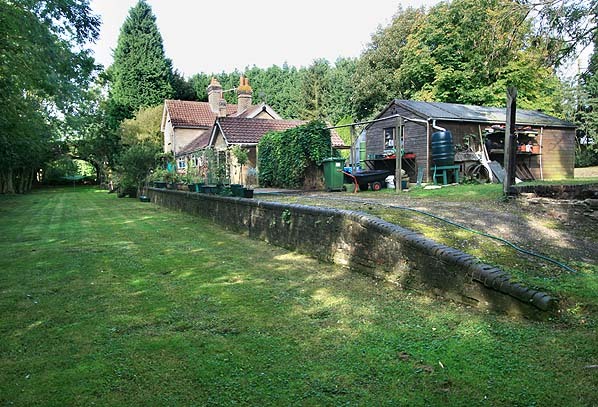 A goods loop was provided to the east of the station with a goods shed alongside the loop. Although a passenger train could pass a goods train at the loop it couldn't pass another passenger train because the goods shed left insufficient clearance. There was a signalbox opposite the goods loop on the up side of the line. A single siding from the loop serving a cattle dock, pens and a coal yard. 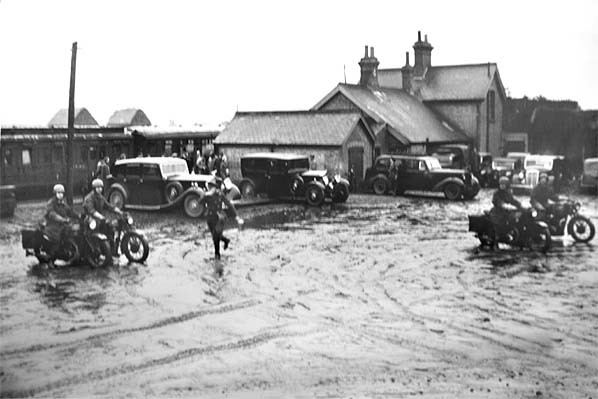 Although the station closed in 1931 it was later used by fruit pickers and two annual passenger excursions, one to Hunstanton and the other to Great Yarmouth, these ran until 1958. 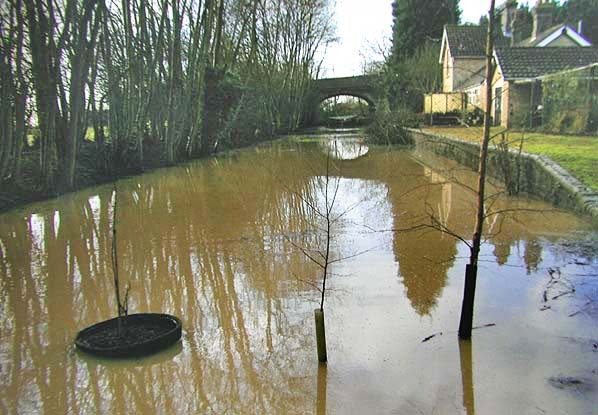 During the 'Great Flood' of 1947 Bluntisham Station was used by the army's Gloucester Regiment to transport men and materials to a breech in the bank of the River Great Ouse that was alongside the line. The breech was eventually filled with old army vehicles. During this period the Duke and Duchess of Gloucester visited the station. provide alternative services. The closure of the line received little mention in the local press and as so few people used the trains little inconvenience was experienced once it had closed. Thanks to Tom Youd, the owner of Bluntisham Station, for allowing me to copy his photographs. 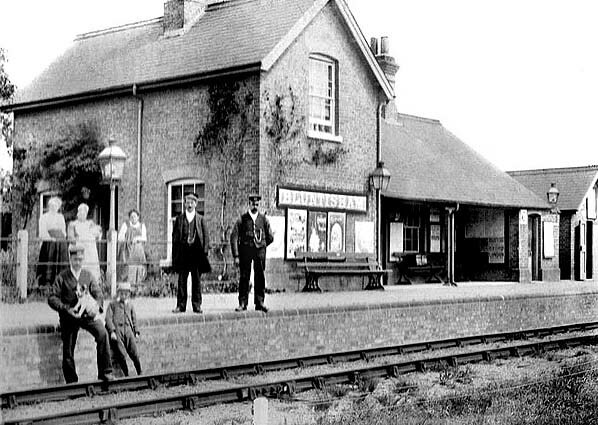 1888 1:2,500 OS map shows Bluntisham station as built. Goods facilities at that time comprised a sinle siding running into a cattle dock and pens at the east end of the passenger platform. At that time, the goods shed shown in the pictures below hadn't been built. 1924 1:2,500 OS map shows little difference from the 1888 map apart form tghe addition of the goods shed and a small building on the cattle dock. 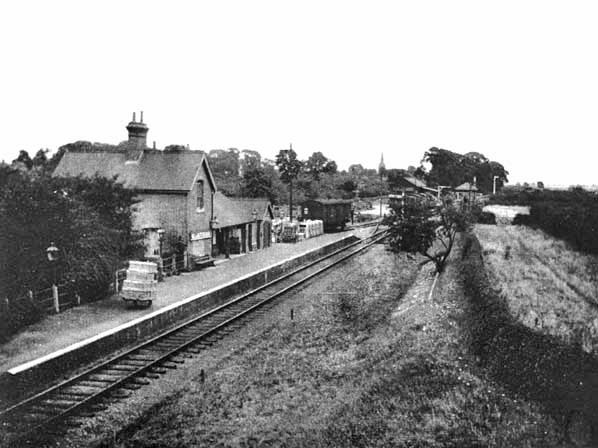 Bluntisham station looking east in c.1926. The van is standing alongside the cattle dock. 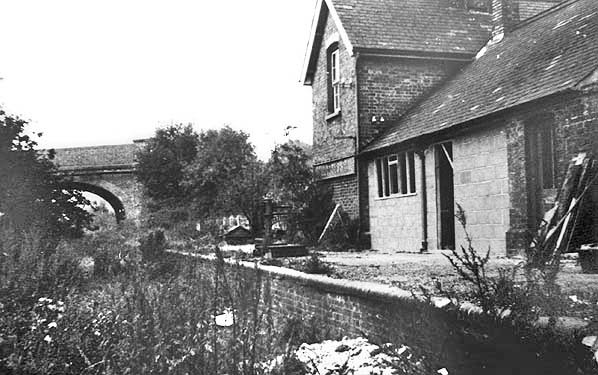 During the 'Great Flood' of 1947 Bluntisham station was used by the Gloucester Regiment to transport men and materials to a breech in the bank of the River Great Ouse which was alongside the line. 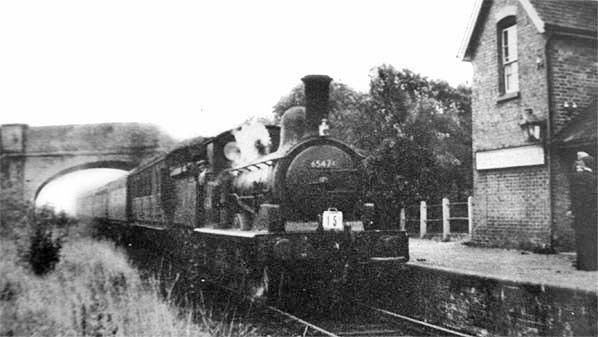 Bluntisham station looking west in 1953 as a service from St. Ives pulls into the platform. On a bright winter day and under canine supervision, an unidentified J17 0-6-0 pauses at Bluntisham before the short run back to St Ives sometime in 1961 - 2. The lamp on the locomotive indicates Class 9, a branch pick-up goods train. The train comprises a number of bauxite-liveried vehicles, indicating they are vacuum fitted, and a number of grey-liveried vehicles indicating non fitted. Further vehicles of both types can be seen in the siding beyond the goods shed with two more just visible above the locomotive. At the rear of the train is what looks suspiciously like an ex-LMS 20T Diagram 1657 brake van. There is another brake van present, the third vehicle in the train, but the angle rules out identification. The brake van at the rear is sitting on the points leading from the sidings. As with all stations on this line, despite passenger services between withdrawn more than two decades previously nameboards and lamps were retained due to excursion traffic which continued to run occasionally until 1958 when the section between Bluntisham and Sutton was closed completely. Thus by the time this photograph was taken Bluntisham was the terminus of the short stub from Needingworth Junction. Wagons for Bluntisham were tripped from St Ives as part of the pick-up goods service from Cambridge. Today, apart from denser foliage and the removal of the track and station fittings this scene has changed little. 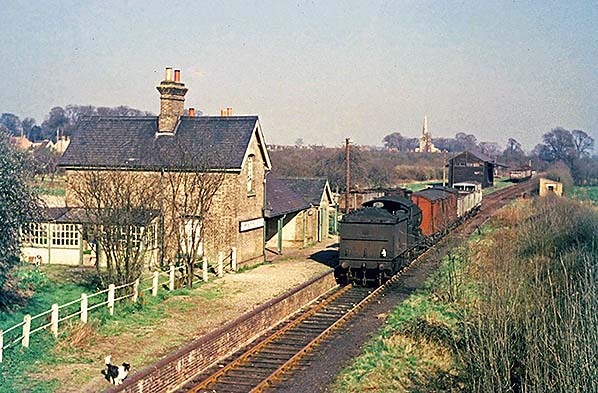 Bluntisham station looking east in March 1976, the cattle dock and goods shed are clearly seen.